The “Freshman 15” is a concept that I’ve heard about forever. I never really thought much of it because it always seemed so far away. Even this past summer, I ate lots of ice cream and seldom exercised. Now that I am at Penn State, I keep thinking of the dreaded freshman 15 and have decided that I should probably start exercising. I’ve never really gone to the gym before because I’ve done gymnastics my whole life and the whole concept sounds painfully boring to me. Going on a walk sounds like a nice and easy way to get some exercise but I keep wondering if a run would be much more/how much more beneficial. The New York Times explains that it depends on what you are trying to gain from this exercise. People exercise for many different reasons; weight loss, heart health, stamina, endorphins, fun, etc.. Nutritionaction.com discussed a study performed at the Lawrence Berkeley National Laboratory in California where they compared the weight loss of runners and walkers after 6 months of doing their respected exercise. They found that jogging or running 11 miles a week led to approximately the same weight loss; the only difference being that walkers had to put in more time to get to the 11 miles. This study showed that it’s not the intensity that effects weight loss, it’s the calories burned. Another study compared about 16,000 walkers with approximately 30,000 runners. The New York Times explained that “Participants were asked about their weight, waist circumference, diets and typical weekly walking or running mileage both when they joined the study, and then again up to six years later”. Almost every single one of the runners was thinner and kept off the weight better than the walkers. Also, when put in a room with a huge buffet right after doing their respected exercise (running or walking), the runners seemed to have a much smaller appetite than the walkers. This suggests a definite possible reason why the runners kept off more weight than the walkers. 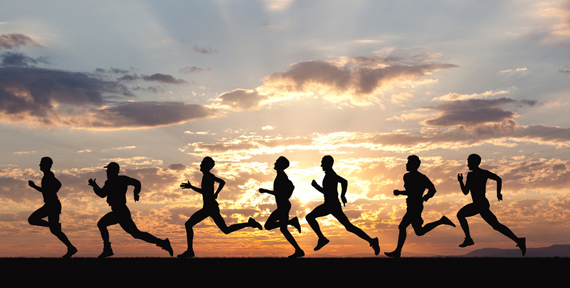 In conclusion, while running is a more vigorous exercise, both running and walking have immense health benefits. One must figure out what he/she is trying to achieve before deciding on one. This entry was posted in Uncategorized on September 18, 2015 by Jennifer Lee Wales. This was a great blog post because of how scary the freshman 15 sounds. I think every freshman knows how important it is to work out and stay in shape because of how close we are to so much unhealthy food. It is interesting that walking and running have similar health benefits, I would have thought running would be a much better form of exercise. This is good news as we do so much walking here at Penn State! I seldom do exercise before I come to Penn State. Freshmen 15 really shocked me and forces me to go to the gym. I knew that walking can not burn as many calories as running do, but I didn’t know that jogging does. That’s cool. You also mentioned that both running and walking have immense health benefits. I found a post online and it stated that walking and running even offer similar health benefits. You might want to have a look at it. Nice blog and it is really helpful! I too have never really been in to working out. I’ve played sports my whole life, so I never went out of my way to go to the gym because I was already exercising every day. But now that I am not playing sports, I too had (and still have) major concerns about putting on weight. Your post was very eye opening! Now I know that although running may help me better maintain my weight, there is nothing wrong with taking a day off to do a little walking instead. Health benefits are the goal, and it’s always good to change it up a little! I’m honestly terrified of the “freshman 15” so I make a point to go to the gym daily. I was really active in high school so I feel like walking won’t do much to keep me in the shape I’m used to being in. I like the feeling I get from doing an intense running session but I never realized that the same calories would be burnt in walking/running the same distance it’s just the time spent is different. I think I’ll stick to running because i want to burn the most in the shortest time possible but now knowing that walking the same distance will burn the same amount as running is useful to know. I’m right there with you, been dreading that freshman 15 ever since school’s started. I too have a major sweet tooth, especially for ice cream and cookies. However, I’ve been a runner (cross country and track) all of high school so it was always easy to get away with my sweet tooth. Considering these competitive sports I was a part of always made me wonder whether I could keep it up afterwards? Running I mean. Walking’s never really been my thing. Coincidently, the studies you’ve researched prove my point. Why walk when you can get more done and lose more weight out of it by running? And if weight loss isn’t your main goal in exercising, then which one would still be better? For example with joint pains? As a runner who has constant hip pains, I went ahead and looked at another side of your question looked at another side of your questio find that walking doesn’t ease hip pain anymore than running does. So I guess I’ll just keep running from that freshman 15! I too dread the freshman fifteen! I really enjoy this blog because it addresses a topic that most college students have thought about. We walk so much throughout our day to get to our classes, that some of us have questioned whether we should even bother going to the gym. I’ve been running track for 9 years, so I’ve never preferred walking over running. I feel more relaxed and healthy after I finish a workout that consists of running many miles. Overall, this was really fascinating! I too am a runner and I’ve never viewed walking as an exercise. I do enjoy walking around campus and often tell myself to walk instead of the bus because I do believe walking more has benefits. 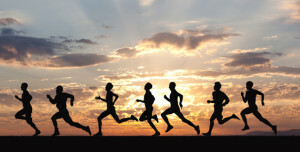 I definitely think that for heart and health reason, running is better for you body. It has so many physically benefits and also mental benefits. Walking is important, and you may loose weight if you walk 11 miles but I believe its necessary for the body to get a good, strong work out. I am a track runner, and I actually despise walking. Running can be annoying, but walking is slow and doesn’t have the health benefits that running has, like you explained in your research. I was curious as to any other benefits of running, and I found that running lets your “heart pump stronger and more efficiently and your muscles to use oxygen more efficiently”. I have always wondered why people walk in comparison to running because I always thought the harder the exercise, the more you are getting to get out of it. I guess I was wrong. I just assumed I would never get the freshman 15, especially here at Penn State because of the abnormal amount of walking we have to engage in. Your blog is very informational and made me realize I should probably research specific exercises to see how effective they are.